According to Clayton Christensen and his co-authors (Disrupting Class), technology has the potential to shape the learning experience for each individual student - a problem we've consistently struggled with in teaching without technology. The problem is that with one teacher and many students, differentiation can be difficult - especially on a consistent basis. With computer-aided instruction, however, I suppose that experiences could be custom fit - all given that software designers can improve upon what we currently have today. Personally, I don't think we're there yet, but the potential is certainly great. Keep up the great work, Heza! 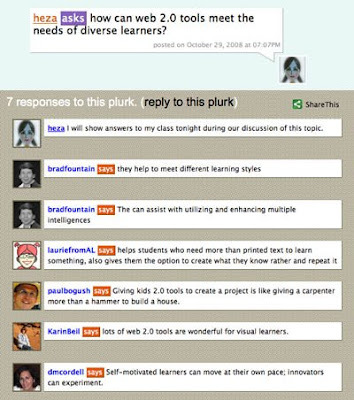 I don't think web 2.0 tools can do the ultimate job of differentiating learning all the time for all learners. But, I think they make it easier for students to demonstrate what they know in different ways. Perhaps software designers will someday create better computer-aided instruction to do this. This conversation reminds me of what I imagine the old one room school house was like. Students all learning different things that were age and ability appropriate. Ironically, maybe technology will bring us back to the one room school house model in the future.